Leading the way in national brain tumor research and patient care. Established with the goal of curing brain cancer, the Preston A. 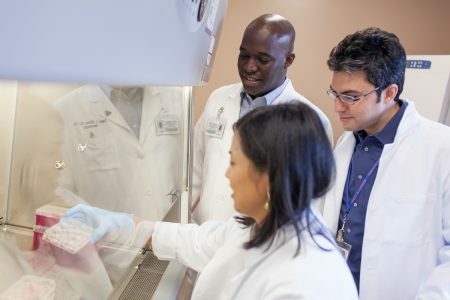 Wells Jr. Center for Brain Tumor Therapy at the University of Florida is the hub for some of the brightest minds in the fields of neuro-oncology, neurosurgery and radiation oncology. National leading researchers and their teams are collaborating daily with physicians who have dedicated their entire careers to finding a cure for brain cancer. Together, they are using the latest molecular, biological, medical and surgical techniques to understand the basic causes of brain tumors and develop entirely new treatment methods. UF Health neurosurgeons perform approximately 600 brain tumor operations annually, making them one of the highest volume academic neurosurgery teams in the country. The Preston A. Wells Jr. Center for Brain Tumor Therapy is home to some of the most advanced neuro-oncology research in the world. The Lillian S. Wells Department of Neurosurgery at the University of Florida is one of the top-funded neurosurgery departments in the United States. Supported by the National Institutes of Health and other grant sources, the department is a destination for some of the top researchers in the area of neuro-oncology. Currently, there are 15 ongoing clinical trials for brain tumors at UF, and four of those, including two first-in-human trials, are hosted by principle investigators at the center. The brain tumor research teams at the center include more than 20 scientists who are focused on finding a cure for brain cancer. Together, they have secured almost $18 million in funding in just the last three years. UF Health Shands Hospital is the only hospital in Florida ranked by U.S. News and World report in 14 sub-specialties, including neurosurgery and neurology.